Welcome to Braxmaviken, only a stone’s throw from the cultural-historical factory town Forsvik, in the Västragötaland county. 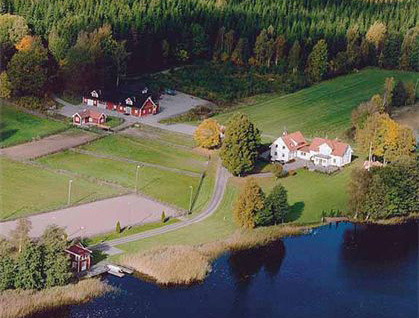 The estate is located by the beautiful lake Viken where the Göta Kanal is connected to the property’s northern boundury is considered one of the most beautiful stretches through an enchanting landscape (grand nature) with small islands and inlets. We receive Swedish as well as international guests weekly and daily in our self-catering cabins. Besides fishing experiences we also offer hunting and crayfishing among many other activites. We offer two different options of stay and they are all close to the water and connected to a pier. All are equipped with comfortable beds and a good modern standard. The surroundings have an astonishing nature which offers everything from berries and chanterelles and an impressive wildlife. Within fifty kilometres there is also a great variety of excursions and tourist attractions. Besides fishing experiences we also offer hunting and crayfishing as well as possibilities to arrange conferences for companies and smaller groups.